Bringing AI into central banks, airlines and ships, manufacturing factories and media companies shows an eerily similar pattern of logic. Even though differences across industries may be vast in progression of digitalisation, availability of data, overall IT readiness and domain-specific challenges, the following five key elements are found transcending industrial borders. Driving through an organisation-wide AI transformation is not executed through multi-million dollar operative paradigm shifts. In its simplest form, adopting AI powered workflows starts by implementing the technology into existing processes, without significant changes to the current ways of working. The process starts by identifying workflows where AI can either grow the revenue streams or significantly increase savings. In retail, the AI system could be a part of building a better customer journey with product recommendations that learn from the customer’s behaviour. As the culture of process augmentation spreads throughout the organisation, the employees learn to think in AI terms and expand that thinking to everything they do. In the real world, the best AI is not the best algorithm, nor the best data. Even the best AI can’t capture the silent know-how of the people without being based on a learning loop involving humans. Hence, the best systems are Human-in-the-loop solutions, where the AI exists to serve people in their jobs while the people are constantly teaching the AI to become better. Rather than thinking people as something you need to automate, you need to think of AI as something permitting humans to focus on meaningful work. In one of our own cases, the AI we built can learn to recognise risk-indicating sentences from investment documents, however it is not supposed to do it alone. It will need a human to bounce off its suggestions in order to get better. The end-value is clear – when the AI workflow is set up correctly, the human work changes to a revision of AI-generated summarisations instead of full 300-page document reviews. In addition, if the AI prevents even a single mis-investment due to hidden information, the value can be tremendously greater. At first glance, AI seems to include many typical elements of IT: data, software, hardware and cloud. The truly impactful side of AI, however, is learning to think old business processes from the perspective of machine learning. This is why “handing off” AI to IT as a toolkit integration project often fails to capture the most essential factor of enabling AI-driven growth: a shift in thinking. Every machine learning project is driven by data created within our business operations. The key difference between machine learning and a regular software project is that as machine learning begins with data, not the tools, every project is unique. This sets up different expectations in terms of predictability, explainability and the way it impacts the flow of business operations. Product and service recommendations is a clear example, where the AI begins to capture the expert knowledge of everyone who interacts with the system, not just one individual. As each test or recommendation adds to the learnings, the amount of automation and value will keep increasing over time, continuously improving the impact of AI. Machine learning based workflows should be built where they can be measured. When selected correctly, their impact can range from a 20% performance increase to a rupture-free production of paper or micro-tailored shopping experiences. However, it’s important to keep in mind, that all AI is built around data, and almost all data is unique and needs to be collected. This is why not one organisation can guarantee results prior to an extensive data exploration and PoC-driven testing and validation. A PoC-driven working model lets you and your AI provider learn from your data, with a rapid iteration cycle and testing of different approaches and models. Many organisations, regardless of their industry, have begun exploring AI in order to gain competitive advantage. We have seen many companies in the Nordics that are in the process of either scoping out the first “low hanging fruits” for AI, or implementing the first Proof-of-Concept solutions. Early adopters are starting to see their first measurable improvements in their organisation and bigger companies might already have internal AI teams, whose work can be expanded by external AI providers and collaborative projects. 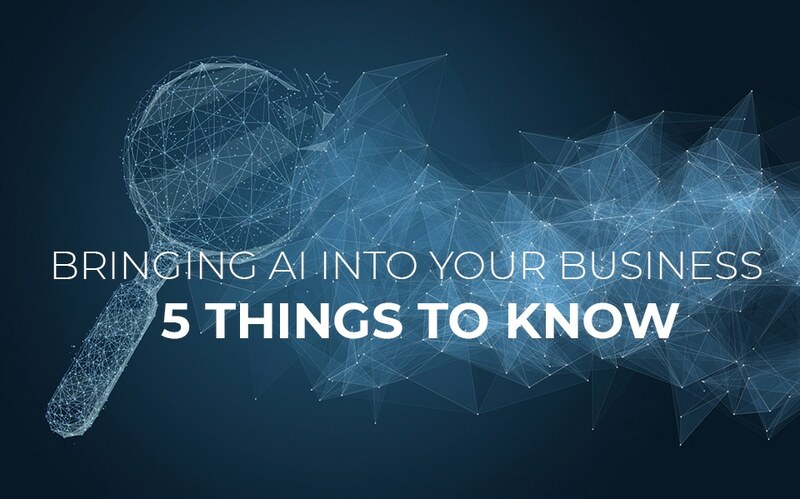 TAKE A LOOK HOW WE HELP BOTH THOSE in their early days of AI, seeking out ways to get on-boarded with AI-driven competitive advantage AND THOSE with in-house AI teams with pre-existing and ongoing AI-powered operations.